African Fusion recently witnessed a demonstration of robotic welding at the Irene premises of Robotic Innovations, the systems integration partner for Lincoln Electric. Nahanni Nagle of Lincoln Electric and Altus Mostert of Robotic Innovations have teamed up to perform a series of high speed welding trials. Mostert points out another ‘first-use’ feature on trial, an in-line anti-spatter system. “The anti-spatter is drawn into the gas shielding line and applied to the nozzle while welding is progressing,” he explains. We are handed masks to watch the welding. The weld starts and we hear a smooth hum, for exactly 11 s. We see a flawless weld seam. The speed? As measured by Lincoln’s Production Monitor which is hooked up to the system: 2,99 m/min or 49,84 mm/s. A weld on a pressure container performed using the Lincoln Power Wave i400 120 kHz inverter controlled by RapidArc software at 2,99 m/min (49,84 mm/s). Nagle tells us why higher speeds are now possible: “There are two elements to it, the one is the hardware inside the Power WaveTM i400 power source, and the other is the software of the RapidArcTM control system. These combine to allow us to run a very tight low voltage arc without generating spatter.” The i400 has a 120 kHz inverter, which gives a switching capability three times faster than the previous 40 kHz generation of machines. This gives you much finer control and faster response. The inverter is able to respond to and manipulate the welding arc much better than the previous generation of inverters. 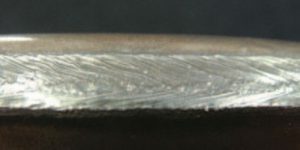 The RapidArcTM waveform, a unique combination of pulse and short arc metal transfer. “On top of that, we run RapidArc software, a programme designed for high speed automatic welding. With traditional pulse welding, you have to run a long arc to prevent spatter and you can’t get high speed when you run a long arc. RapidArc integrates short arc control into pulse welding so that you can run pulse with very short arcs and very little spatter,” explains Nagle, “and this works much better on the 120 kHz machine than it ever did on the slower machines,” he adds. The pulse period: Increases the arc energy, forms and squeezes a molten droplet on the end of the wire. The puddle rise period: The current is ramped down, reducing the plasma force and allowing the weld puddle to rise up towards the droplet. The short circuit period: The arc collapses, and the droplet touches the weld puddle. 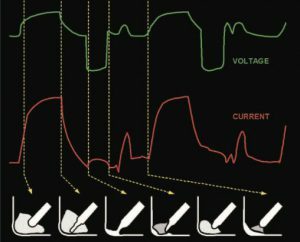 The puddle repulsion period: In response to a short-circuit, a gentle current boost increases the plasma pressure, pushes the puddle away and conditions the electrode tip. This cycle, together with the i400 120 kHz inverter, ensures reliable and spatter-free separation of the droplet and the puddle and a stable welding rhythm – significantly extending the speed envelope for robotic applications.